56 I WRAPS I 2015 D e s i g n Vector objects, text, imported raster art and blocks of color can all be added in between the top masked layer and the bottom photo. 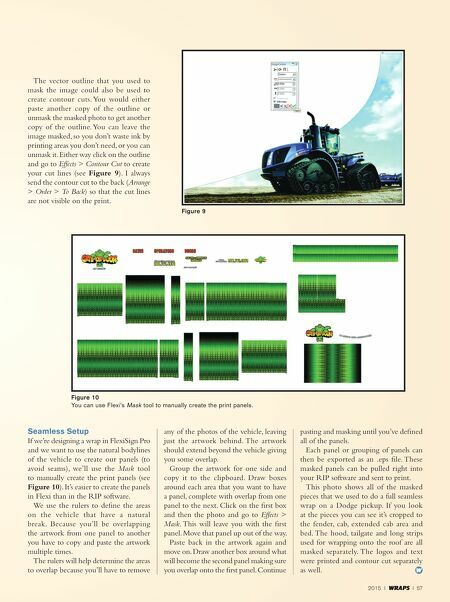 This gives you the flexibility to make quick changes and to move the artwork around any obstacles (see Figure 7). It also makes it easy to proof the vehicle wrap with the customer as well. 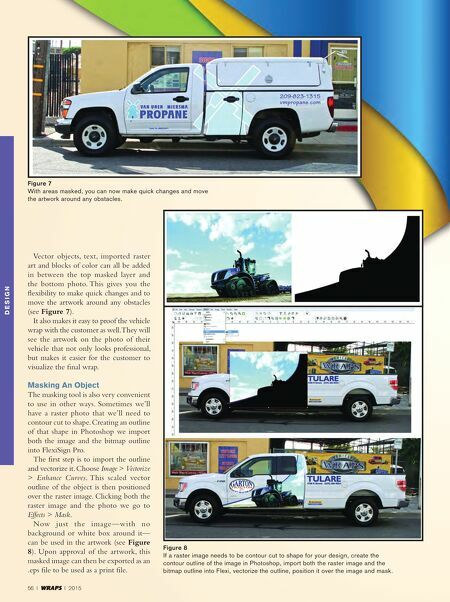 They will see the artwork on the photo of their vehicle that not only looks professional, but makes it easier for the customer to visualize the final wrap. Masking An Object The masking tool is also very convenient to use in other ways. Sometimes we'll have a raster photo that we'll need to contour cut to shape. Creating an outline of that shape in Photoshop we import both the image and the bitmap outline into FlexiSign Pro. The first step is to import the outline and vectorize it. Choose Image > Vectorize > Enhance Curves. This scaled vector outline of the object is then positioned over the raster image. Clicking both the raster image and the photo we go to Effects > Mask. Now just the image—with no background or white box around it— can be used in the artwork (see Figure 8). Upon approval of the artwork, this masked image can then be exported as an .eps file to be used as a print file. Figure 7 With areas masked, you can now make quick changes and move the artwork around any obstacles. Figure 8 If a raster image needs to be contour cut to shape for your design, create the contour outline of the image in Photoshop, import both the raster image and the bitmap outline into Flexi, vectorize the outline, position it over the image and mask.